How could sea level rise, ocean acidification, and rising air and water temperatures impact water quality and wildlife habitat in the Sarasota Bay watershed? A new report, managed by the Sarasota Bay Estuary Program and authored by Shafer Consulting, aims to use scientific projections of climate change to predict potential impacts on community goals for improving Sarasota Bay. Click the cover image at right to download the report (PDF). 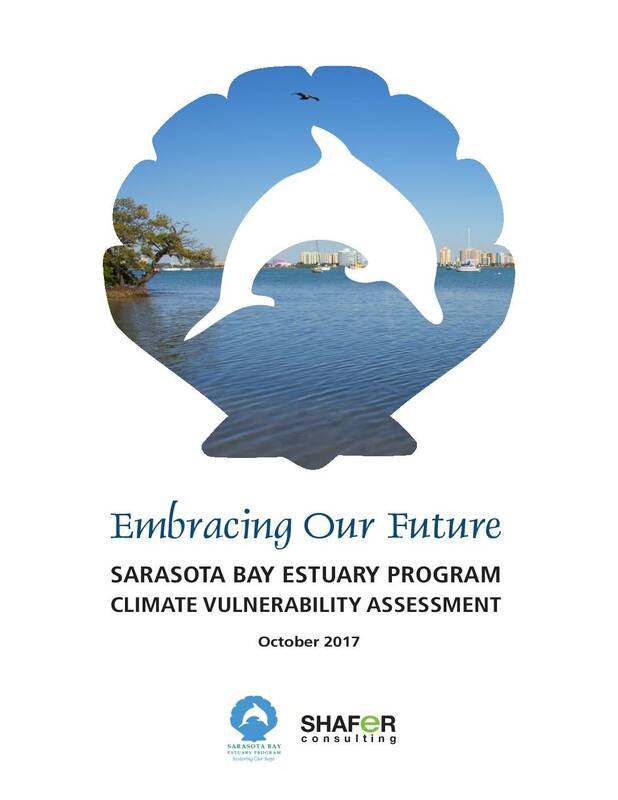 In 2016, the Sarasota Bay Estuary Program received funding from the EPA Climate-Ready Estuaries Program to conduct a risk-based assessment of its Comprehensive Conservation and Management Plan (CCMP). The goal of the assessment was to identify goals within the CCMP that may be vulnerable to climate change impacts such as sea level rise, ocean acidification, changing air and water temperatures, and changes in precipitation patterns. Contact Darcy Young by email or at (941) 955-8085 with questions about the report.